Maryland Uniform Supply: What Does Your Shirt Say About You? Uniform shirts cultivate a deliberate image about a company – they’re a visual representation of how a business does business. Think about it: colored golf shirts with an embroidered logo are functional clothing items for employees who do a lot of moving on the job – grocery stockers, sales representatives at hardware stores, and the like. Casual office environments with an emphasis on accomplishing large workloads successfully and with minimal face-to-face client interaction also often permit polo shirts as uniforms. Many IT companies fall under this category, or offices that have regularly scheduled casual Friday’s, when employees can sport no-fuss clothes that still give off a professional image. Collared button downs send off a different signal: usually that little manual labor is required of those who wear them, and that the company emphasizes the promotion of a public professionalism. In many cases, a collared shirt can be a clue to an employees’ position, with managers and higher-ups oftentimes wearing tailored business attire. 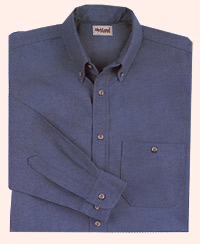 Chambrays – collared button downs made of denim – are a less formal yet still classic alternative that are suitable for manual laborers and executives alike. What does your work shirt say about you? Does it lend the image your company is trying to achieve? Is it appropriate given your day-to-day tasks and responsibilities? Whether critical protective gear or simple clothing that gives your employees that professional look, uniforms can play an essential role in shaping the image of both the employee and the company alike. Lord Baltimore Uniform, a uniform supply company in Maryland, can consult with your management team to determine what type of uniform apparel and clothing are apt for your company and employees. From industrial work shirts to golf shirts, button down oxfords, and more, Lord Baltimore Uniform has an expansive product list and offers a complete uniform rental program that includes provision of garments, weekly pick-up and delivery, cleaning and upkeep. They also provide lease and purchase program options, depending on your needs. Connect with us on Google+, Facebook, LinkedIn, Pinterest, and Twitter. This entry was posted on Friday, December 14th, 2012	at 7:43 pm	. You can follow any responses to this entry through the RSS 2.0	feed. Both comments and pings are currently closed.